160 CFM, 1600 RPM, 115 V, 1 Speed. 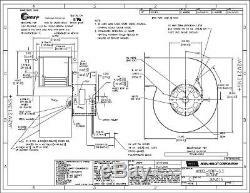 Discharge Flange Mounting Holes: 4.12" x 1.47". 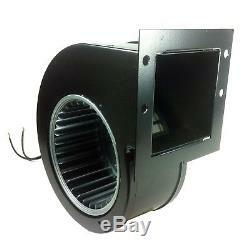 Replaces: Fasco 50755-D500, WWG 1C982. Product Dimensions: 10 x 10 x 9.5 inches. Item Weight: 5.6 pounds. 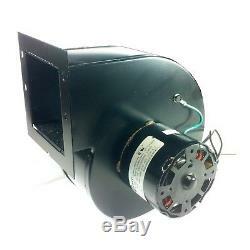 General replacement wood stove fireplace blower. 160 CFM, Sleeve Bearing, 115 V, 1600 RPM, 1-Speed. Your complete satisfaction is very important to us! If you receive a damaged or defective item, let us know! We will expedite a replacement to you and help you return the original. We are committed to your complete satisfaction! The item "Century 458 Replacement Blower for Wood Stoves 160 CFM Replaces Fasco 50755" is in sale since Wednesday, November 8, 2017. This item is in the category "Home & Garden\Home Improvement\Heating, Cooling & Air\Fireplaces & Stoves\Replacement Parts". The seller is "carsncoffee" and is located in US. This item can be shipped to United States.